Tightly sprung trap for small vermin eg. squirrel, rats, stoat, etc. All users must satisfy themselves they comply with the requirements of the act and traps must only be set where they will not catch animals other than those they are being set for. 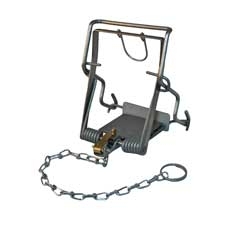 Traps should only be set on land owned by the person setting them, or where they have permission from the landowner to do so. Avoid setting them on or near public footpaths, public rights of way. Traps must be checked regularly.